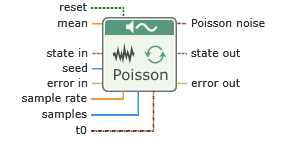 Generates a pseudorandom sequence of values that are the number of discrete events that occur in a specific interval of a unit rate Poisson process. You can use the Poisson process to describe the probability of a certain number of events happening in a given period of time. For example, you can use the Poisson process to describe the nuclear decay of atoms and the number of messages a transmitting station receives. Interval of a unit rate Poisson process. mean must be greater than or equal to 0.